China’s climate policies: how have they performed, and where do they need to go? On the heels of the major China-US joint announcement on climate change last Friday, and with just two months remaining until countries meet in Paris to form a new global climate agreement, people around the world are looking to understand how China is taking climate action. As the world’s largest emitter of greenhouse gases and yet a developing country, China plays an instrumental role in the global effort to address climate change. So what’s China been doing, and what does the country need to do in the future to limit warming? Two new papers from the Open Climate Network offer some insights to those questions. Assessing Implementation of China’s Climate Policies in the 12th Five-year Period is a comprehensive assessment of China’s efforts since 2011 to reduce emissions and act on climate change, while Peaking China’s CO2 Emissions: Trends and Mitigation Potential surveys models that project many aspects of China’s future growth in order to analyze the likely course of emissions in the coming decades. The research shows how China’s climate action has set the stage for its emissions to plateau between 2020 and 2030, and decline thereafter. With further ambitious actions, the country can peak its emissions at a lower level than planned, with lower cumulative emissions than initially thought. The 12th Five-Year Period (FYP) (2011-2015) marked a new era in China’s climate action. Its climate policies shifted from setting broad goals or statements of priority, to an emerging climate policy framework comprised of specific instruments to drive emissions reductions. Chinese leadership now sees climate and energy policies as a way to seize economic benefits domestically, particularly through job creation, decreased pollution and financial savings from improved efficiency, energy security and health. 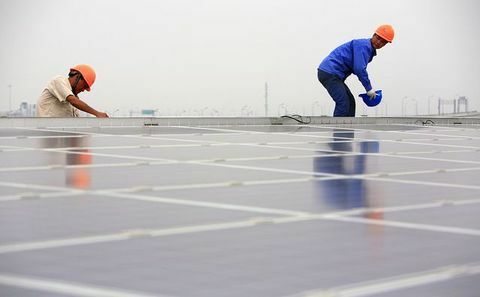 China is now on track to meet or even exceed the numerous climate and energy targets it set for the 12th FYP. The Plan established binding targets to increase forest coverage to 21.66%, reduce energy intensity by 16%, reduce carbon dioxide emissions intensity by 17%, and increase the proportion of non-fossil fuels in the primary energy mix to 11.4%, all by 2015. China’s forest coverage rate in 2013 was 21.63%, and the proportion of non-fossil fuels in primary energy consumption was 11.2% in 2014, both very near to achieving the 2015 targets. 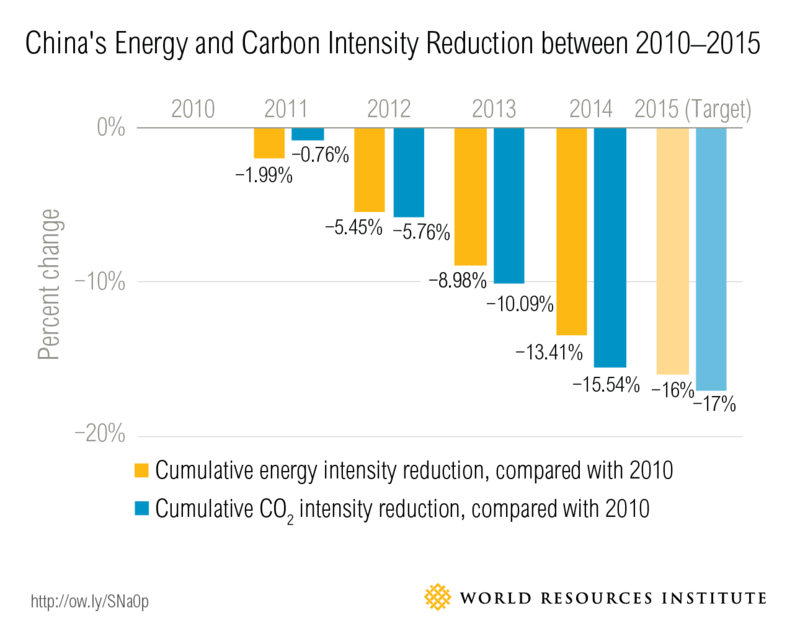 OCN analysis estimates that China reduced energy and carbon intensity by 13.4% and 15.5% in 2014. China’s progress domestically has enabled the country to put forward meaningful international commitments backed by concrete national policies. This can help inspire confidence in the international community that China will achieve its goals. Steering a large and quickly evolving economy toward a sustainable future will have its challenges for any country, China included. China has been learning by doing though, and its progress to date demonstrates that it’s adapting quickly and making headway. To build on current progress towards its vision of low-carbon development, China can enhance transparency and data accuracy, strengthen its policy enforcement and compliance mechanisms, and develop more concrete policies to advance carbon capture and storage. Furthermore, it can improve policy coordination, encourage innovations in policy-making, and develop a more comprehensive system for tracking the implementation and impact of its policies. Energy consumption accounted for 78.5% of China’s GHG emissions in 2012, and coal accounted for 66% of energy consumption in 2014. Total energy and coal consumption targets are under consideration, and could be included in the national, sectoral and provincial 13th FYP. If they are, the government will choose a form for those targets to take, which may be either a binding target backed by direct government intervention, or an expected target, which is achieved through softer means. How the government chooses to set this target will indicate the country’s ambition level, and will directly shape China’s emissions trajectory. In November 2014, China committed to peak its carbon emissions by around 2030, with the intention to peak even earlier. 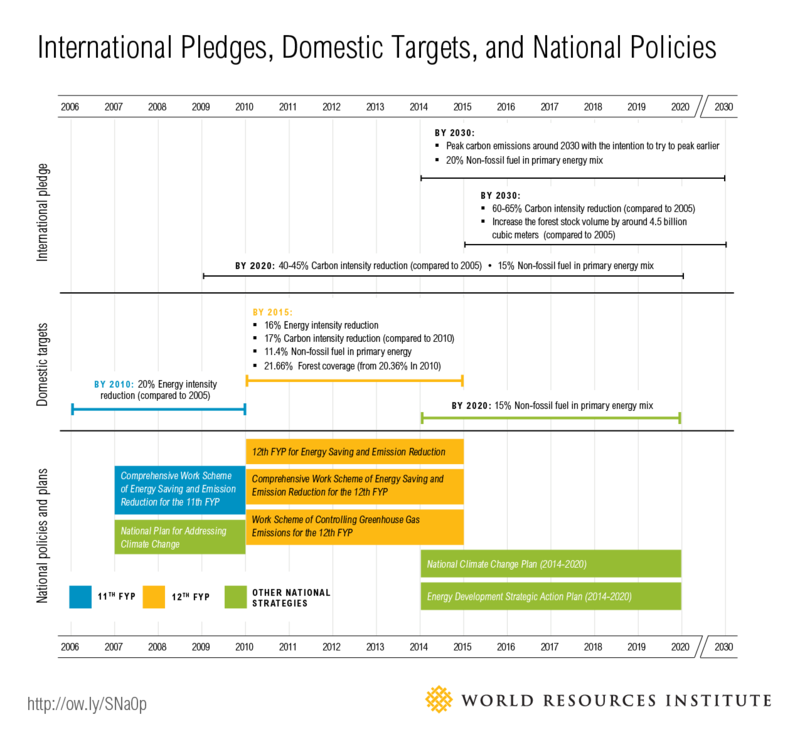 To make good on this pledge, China will need to develop quantitative targets for the absolute growth of GHG emissions. While the government has not identified the peaking level, studies suggest China should be able to cap its energy-related CO2 emissions at around 9–10 GtCO2 by 2020 with enhanced policies, which the government has started to lay out. Government officials will then need to disaggregate the country’s GHG growth cap to regional (provincial and municipal) and sectoral levels to ensure effective implementation. Studies have shown that putting a price on carbon is a key policy lever to ensure carbon emissions peak by 2030 or sooner. Last week, President Xi announced that his administration plans to launch a national emissions-trading system in 2017. To get ready for that major undertaking, the government is working to overcome a variety of technical and political barriers, such as building a robust emissions measuring, reporting and verification system, and determining and allocating emissions allowances. The significance of China’s efforts to advance climate action in recent years—combined with those by the United States, European Union and others—has produced a wave of momentum heading into the upcoming international climate negotiations in Paris. In just a few years, China has gone from no international commitment on climate, to committing at the 2009 Copenhagen climate conference to reduce carbon intensity, to pledging to peak its carbon emissions and implement a suite of policy instruments to drive down emissions. With sustained effort in the years ahead, the country can continue this trend, exceed its low-carbon ambitions, and inspire greater climate action around the world. This article was published originally on WRI's website. Links to full publications are here: Assessing Implementation of China’s Climate Policies in the 12th Five-year Period and Peaking China’s CO2 Emissions: Trends and Mitigation Potential. Ranping Song is the developing country climate action manager at World Resources Institute (WRI). Qi Ye is a senior fellow and director of the Brookings-Tsinghua Center for Public Policy in Beijing.